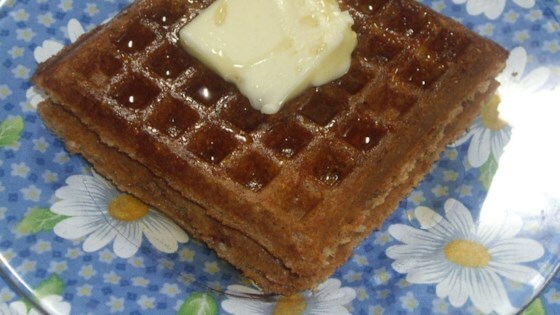 "These are hearty waffles using spelt flour, coconut milk, and oil. Substitutions are included if you don't have an ingredient on hand." Combine spelt flour, flax seed meal, baking powder, cinnamon, baking soda, and salt together in a bowl. Stir coconut milk, coconut oil, eggs, vinegar, and vanilla extract together in a separate bowl. Add coconut milk mixture to flour mixture; stir to combine. Let batter thicken for 1 to 2 minutes. Pour about 1 cup batter into waffle iron. Cook until golden and crisp, about 6 minutes. Repeat with remaining batter. Options: Reduce the milk by 1/4 cup and add 2 mashed bananas or other mashed fruit. Reduce the milk by 3/4 cup and add 1 cup flavored yogurt. Makes great freezer waffles. I made the spelt version and a gluten free version . They were amazing. No sugar needed. I had everything needed on hand. Great recipe.